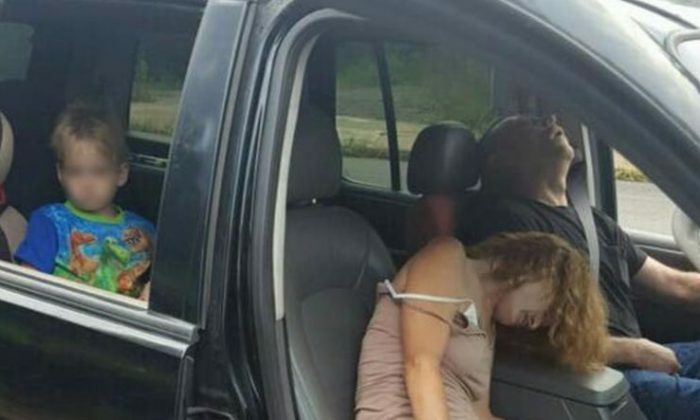 A now-viral photo of a 4-year-old boy in an SUV as his parents were passed out while allegedly on heroin was shared on Facebook to show the damages caused by the heroin epidemic that’s inundated the United States. The city of East Liverpool, Ohio, shared the picture on its Facebook page on Thursday after responding to a call of an incapacitated motorist. “We feel it necessary to show the other side of this horrible drug. We feel we need to be a voice for the children caught up in this horrible mess. This child can’t speak for himself but we are hopeful his story can convince another user to think twice about injecting this poison while having a child in their custody,” East Liverpool police wrote on the Facebook page. Police admitted that the decision to release the photos might stir controversy, but they explained it is necessary to show the effects of the drug. The officer who responded to the scene said the driver’s head was bobbing, while his speech was unintelligible, FOX8 reported. The driver was identified as James Acord, and he told the officer he was taking the passenger, identified as Rhonda Pasek, to a hospital. According to the Centers of Disease Control and Prevention, heroin use has increased across the United States in recent years. “Between 2002 and 2013, the rate of heroin-related overdose deaths nearly quadrupled, and more than 8,200 people died in 2013,” the agency states.